I loved making this dress. I hope Butterball will entertain me by wearing it in every color. 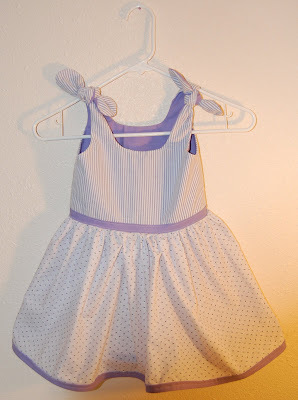 I used the toddler version of Rae's Itty Bitty Baby Dress. Super easy. Wait, back up. Super easy except for the piping. I found out the hard way that I'm not a piping kind of girl (at least not for now), so I connected the bodice and the skirt with a simple band, and then top-stitched it (I heart top-stitching). I'm happy with how it turned out, although next time I might modify the fullness of the skirt (it's a little poofy, no?). its soo cute, I cant wait to put it on her! Adorable!! I like the poufy-ness. WOW!! It's adorable!! Good Job! SOOOO CUTE,WHAT PATTERN DID YOU USE? I TO LOVE THE FULLNESS.